For people in Adelaide Metropolitan, Mount Lofty Ranges, Lower Eyre Peninsula, Eastern Eyre Peninsula, Yorke Peninsula, Flinders, Mid North, Kangaroo Island, Riverland, Murraylands, Upper South East, Lower South East and parts of West Coast, North West Pastoral and North East Pastoral districts. Issued at 3:34 pm Monday, 10 September 2018. A strong and fast moving front will enter the west of the State tonight to be around Ceduna by sunrise Tuesday, reaching Oodnadatta to Renmark late afternoon. 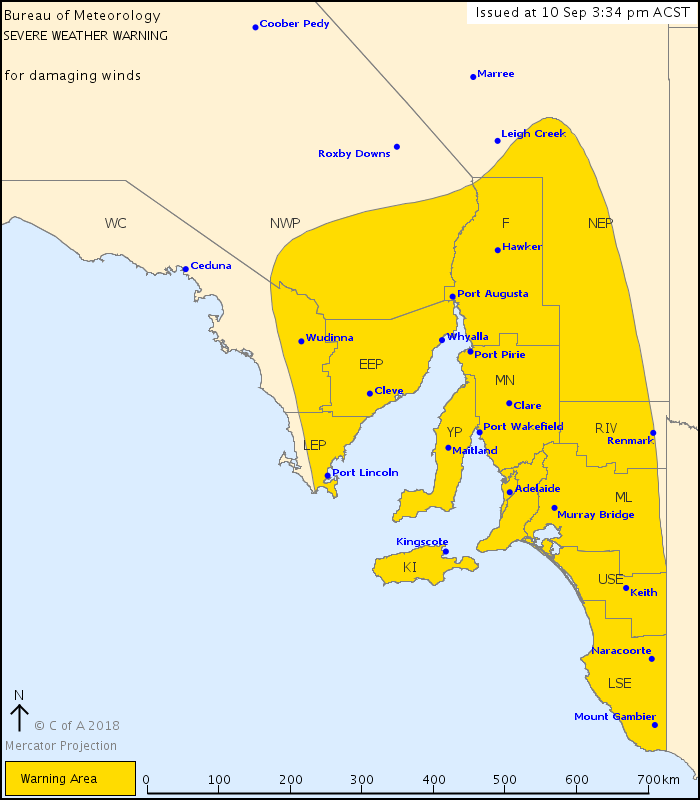 Ahead of the front, damaging north to northwesterly winds averaging 50-70 km/h with gusts to around 100 km/h are possible over Eyre Peninsula from around sunrise Tuesday. These winds will extend to central and eastern parts of the warning area during the morning. As the front moves east during the afternoon, the potential for damaging winds will contract to eastern and northern parts of the warning area.